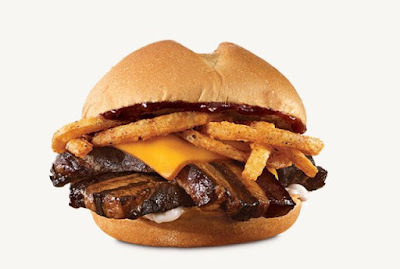 Citing positive response and customers' requests, Arby's has brought back their Smokehouse Pork Belly Sandwich for a limited time. The sandwich was first introduced last year (and made my 2016 top five new fast food items list) as a fast food first and sold out in a matter of weeks in some markets. The Smokehouse Pork Belly Sandwich features two strips of hickory-smoked, thick pork belly, smoked cheddar cheese, crispy onions, barbecue sauce, and mayo on a toasted star cut bun. You can check out my previous review of it here. The return of pork belly also means that the very tall Smoke Mountain Sandwich is back for a limited time. It stacks smoked brisket, pit-smoked ham, smoked pork belly, smoked cheddar, smoky BBQ sauce, and crispy onions between the halves of a toasted star cut bun. In addition to returning the sandwich, Arby's has also brought back the seasonal Orange Cream Shake for a limited time.